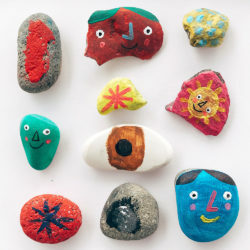 Hello again Bootcampers! 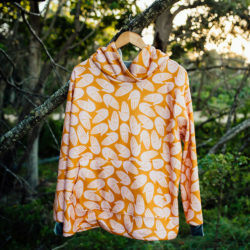 We’re now into week 4 of our Spoonflower Basics Bootcamp and I’m sure your Spoonflower muscles are growing! Today Spoonflower crew member Meredith is here to show you how to download the Adobe Swatch Exchange (ASE) file and import it to Photoshop. This file can also imported into Adobe Illustrator as well. This file is a great resource for making your colors as accurate as possible, and is designed to work alongside the Spoonflower Color Map! 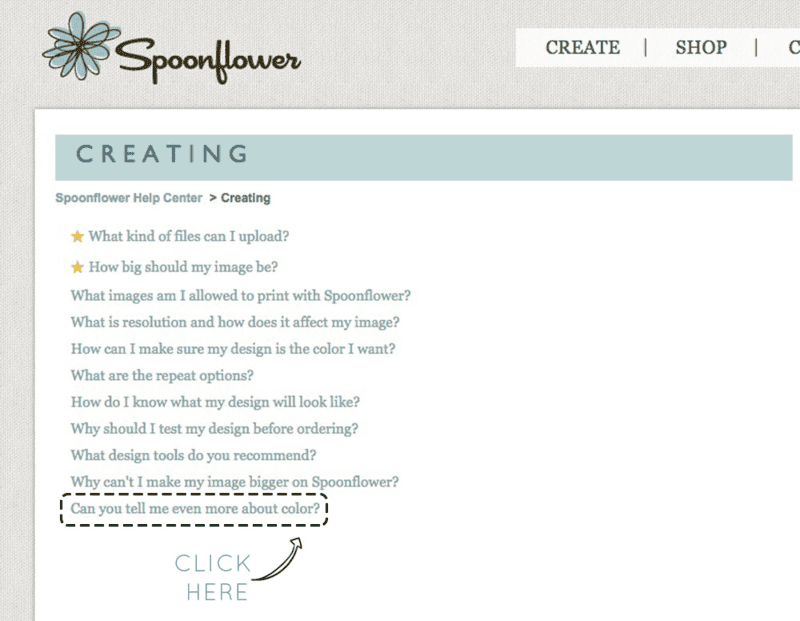 To locate the ASE file, visit the Spoonflower homepage and select the help icon in the top left corner. Once on the help page, scroll down to the Creating section and expand the article selection by choosing See all 11 Articles. When viewing the full Creating section, select the last option – Can you tell me even more about color? 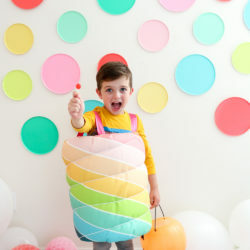 From the help page about Color, scroll to the section labeled Spoonflower Color Map and download the ASE File to add the file to your computer. 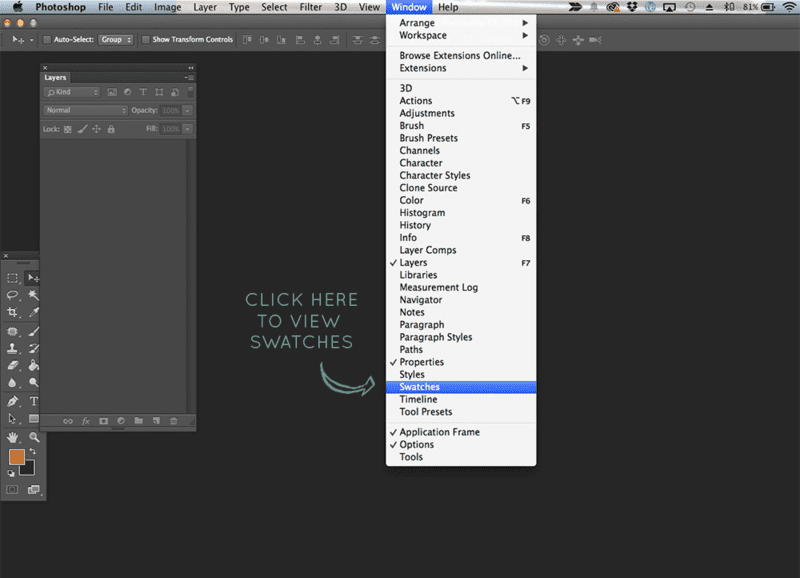 Once you’ve downloaded your ASE file, open Photoshop and locate your standard swatch palette. If your swatches aren’t already visible, you can find them by going to the Windows drop down menu and selecting Swatches. To add the downloaded ASE swatches, select the drop-down tool on your Swatches window and choose the Load Swatches option. With your files open, search for the ASE file. 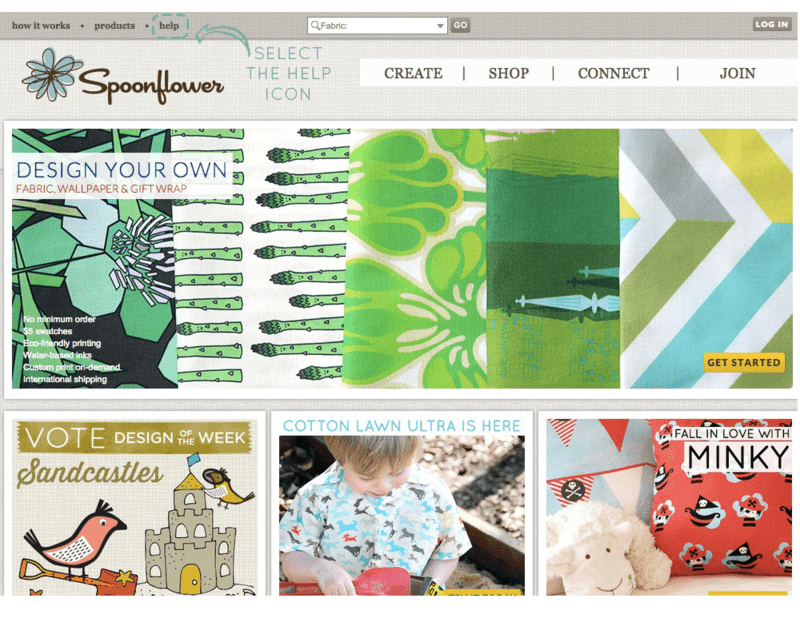 If you have trouble locating it, you can enter Spoonflower Color Map in the search bar to easily locate the file. Once you have the file, double click on the file name to add the new swatches. 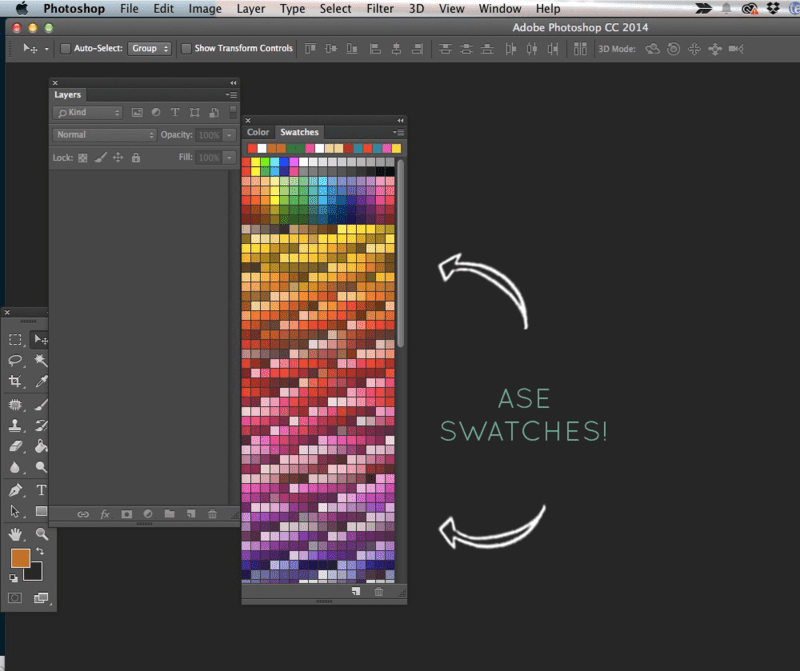 Now that you’ve downloaded the ASE swatches, you’re ready to start designing! **Working with Adobe Illustrator? 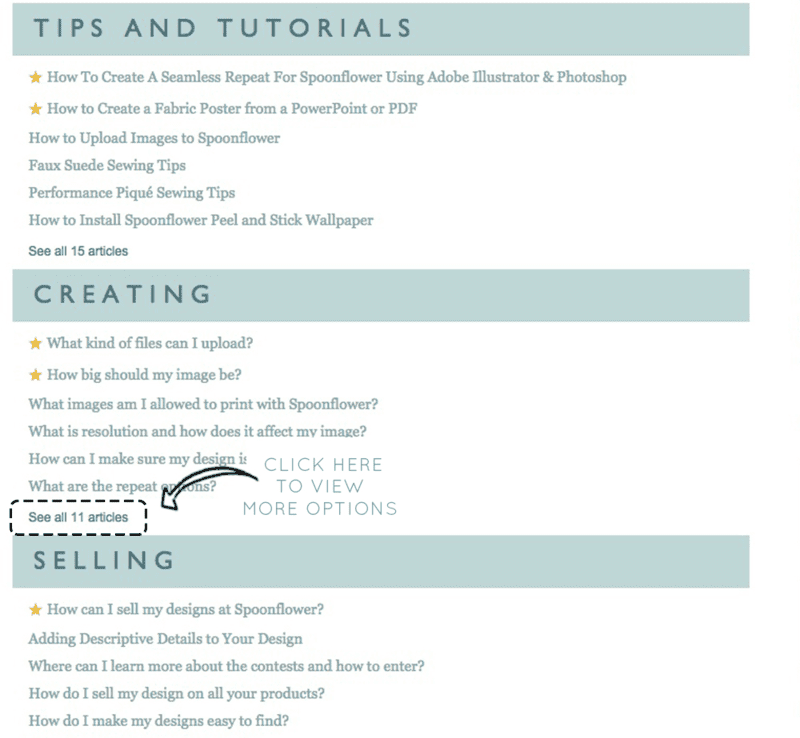 Take a look at this post for help adding Spoonflower ASE file to Illustrator. 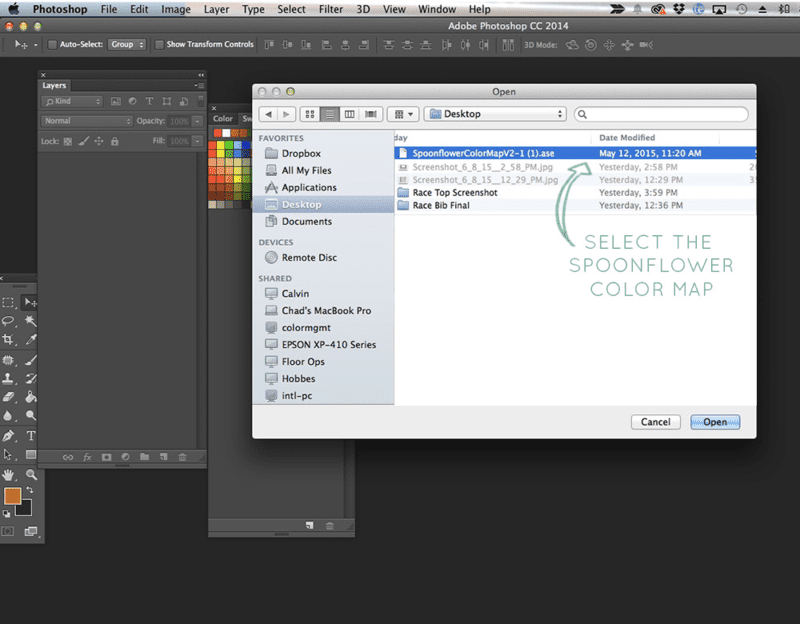 Could you please explain the steps to import the ASE swatches into Adobe Illustrator (CS6)? I seem to be having some trouble with it.. Thank you! I was able to load it in Illustrator CC, so hopefully it’ll be some help even though it’s a different software version. 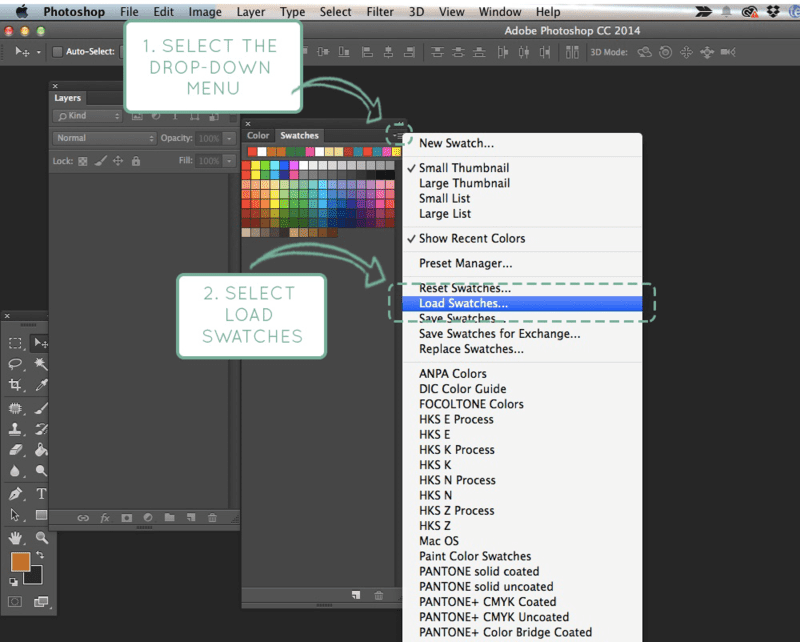 With the swatches window open, click on the drop down menu in the upper left corner and choose Open Swatch Library and then Other Library. Find your downloaded ASE file and select it. I hope that helps. Thanks for jumping in, Anon! 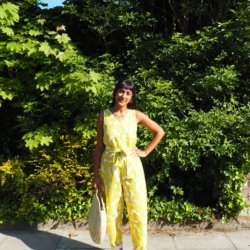 Heidi–if you still need help, please let us know! Hi Anon, can you help me please? When I click on the link that says Adobe Swatch Exchange File, it is opening my illustrator program and then a prompt is appearing saying the name of the file and that it is in an unknown format and can not be opened. I am not getting an opportunity to save the Swatch Exchange File to my computer and then follow the steps for loading swatches to my illustrator program. Please advise. I have downloaded the file and opened it without problem in Illustrator, however when searching the file for the color numbers in the limited palette Goat challenge I came up short. Am I searching for the incorrect numbers? Where is the file? I have looked everywhere and can’t find it. Can you add a direct link? « Pantry-organizing, Recipe-saving Kitchen Stickers!